Start by poaching four or five boneless chicken breasts in one cup of water with salt or bouillon mix added. You will reserve this broth after the chicken is cooked in it, and use it as the basis for your sauce…. Ladle some of this sauce into the base of a baking pan. Coat the sliced chicken meat in it, and arrange them as shown below. This smoky chicken is great the next day after its initial baking, cooked for a few minutes under a broiler (see first photo for results). The broiled chicken is good in pita sandwiches or wraps, with lettuce as a refreshing counterpoint. Shape and fry hamburger patties. Season them before cooking with your preferred pepper and salt. I like to mix the ground beef with a little Pimentón de la Vera and Himalayan salt. When the beef patties are cooked thoroughly, spread a light layer of mayonnaise over them. Cover these hamburger patties with chopped green chiles (Hatch or Old El Paso brands, for example). A few shreds of chopped pickle may be added to the chiles. Cover the chopped green chiles with shredded cheese (I used Colby-Jack blend here). Bake in a hot oven for a few minutes until the cheese atop your green chile cheeseburgers is melted, or browned if you prefer. 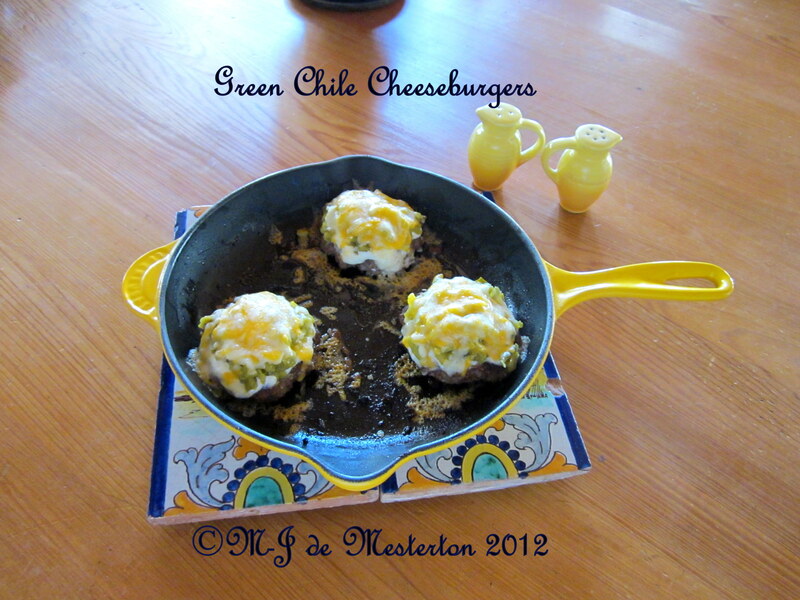 These green chile burgers are so sumptuous that they are edible without buns, making them an elegant low-carb main dish.